MOT Exemption - Enfield Bullets; pre-1960 owners beware! Insurance & Registration issues etc.. I have been taking a closer look at the government guidance on the new ‘Vehicles of Historic Interest’ categorisation that starts on 20 May and covers the new rules about MOT exemption. Whilst many may welcome these changes there are considerable grey areas that are open to interpretation and diesel converted Bullets can fall foul of these changes in regulations. Within the guidance vehicles that have been ‘Substantially Changed’, must continue to be tested annually, additionally ‘If the type of vehicle is still in production, it is not exempt from periodic testing’; and the Bullet is still listed in the Enfield catalogue albeit with the new EFI motor and frame combination. (I would not like to be the one arguing the toss on this one in front of an uninterested and uncaring judiciary). As regards the engine swap being classed as ‘substantially changed’, the guidance states that 'alternative cubic capacities' and 'alternative original equipment’ engines would not be classed as ‘substantial changes’. Even Taurus Bullets fall foul of the ‘still in production’ rule. Ok so in essence, I don’t think and diesel Bullet will be MOT exempt - Even those currently exempt under the pre-1960 ruling. Sorry to wee on anybody’s parade but I thought it would be better to get it out there before someone ends up loosing their shirt after an accident. Re: MOT Exemption - Enfield Bullets; pre-1960 owners beware! Exactly - therein lies the catch! Unless you can prove the V8 conversion was done over 30 years ago your no longer ellidgeable for ‘non-MOT’ status as the V8 was never offered as a factory option. There is going to be a lot of customs suddenly needing MOT’s that were previously exempt under the pre-1960 rules. That's the UK gov (torys and labor alike) milking more money out of car and bike owners ! WHY do you brits put up with this level of crap !! I wasn't aware of the still in production rule, but it surely would be referring to model? the name bullet is still in production but is not the same as the original, take the case of the Toyota corolla the most produced car, I think they are on MK 14, so nothing like MK1. Also you could argue royal enfield went out of business, only enfield india carried on . Anyway I saw the new bike at the Stafford show 650 twin I would think this will replace the bullet shortly. Well it’s old Sluggy MOT day tomorrow so fingers crossed that no more parts fall off on the way. I’ve stripped off the trailer hitch - had to be done otherwise I have to move the rear number plate and add a light above it. New rear tyre (again), I’m going back to Avon SM’s as the TT100 didn’t last 15,000 miles whereas I can get double that from the old Avon squaremaster. Number plate light not required for MOT. sbrumby wrote: Number plate light not required for MOT. Still I have a new MOT in my grubby mit so good to go for another year, Europe here we come! It’s getting a but ‘muddier’. The FBHVC are supposed to be putting up contacts to act as advisors - indeed they have published a list and it includes the FS1E club but no Royal Enfield representation. So for motorcycles the only criteria are Q plates, and built up classics! Latest from the Federation of British Historic Vehicle Society. "There are no technical VHI criteria for bikes. 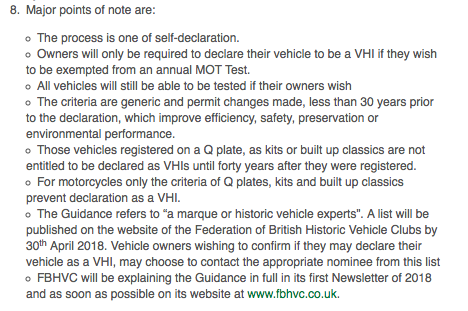 The only constraints are those set out in the guidance; Motorcycles on Q Plates, which are kits, kit conversions or reconstructed classics cannot be VHIs until forty years after their date of registration. So motorcycles forty years old or more can safely declare as MOT exempt even if they are diesel conversions." As this is likely to affect a lot of us in the UK, I would like to propose Dave as the go to guy for all matters concerning VHI. This is of coarse if he is prepared to take on the role? Then in the future if anybody has a query they can ask Dave. Likewise if anybody gains any knowledge on the subject, pass it on to Dave.